Good food is good economic development. 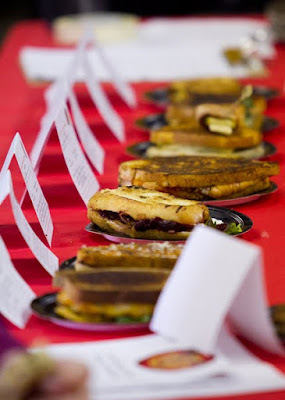 Photos from our Wisconsin Grilled Cheese Championship are in. Good food is good economic development. More than 600 people pre-registered for our First Annual Wisconsin Grilled Cheese Championship. More than 1,200 people attended from at least 6 states. Professional photos of the event are linked below. "Iowa County continues its leadership in creating innovative economic development opportunities around local agriculture and our wonderful quality of life in Iowa County." 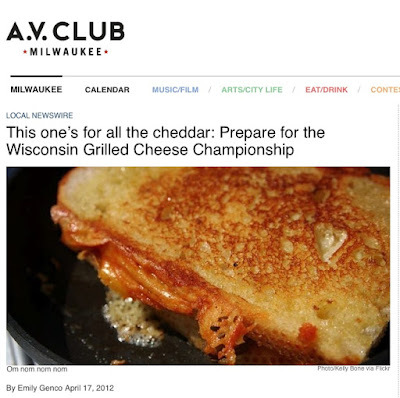 "The 2012 Wisconsin Grilled Cheese Championship was a huge success and shows just what kind of strong interest people have in our area from across the region and neighboring states. This is a great place to live and work and these kind of events help highlight that fact." Good food is good economic development. Check out the new professional photos of our First Annual Wisconsin Grilled Cheese Championship. Photo credit Tyler Ensrude, Dodgeville, WI. Many thanks Tyler! Dodgeville Chronicle article written by Jane Berns Jones. Thank you Dodgeville Chronicle. Iowa County Area Economic Development. Come grow with us. Thanks ICAEDC Board Chair Lorin Toepper for creating this event and special thanks to my friend Beth R. for organizing and managing! Thank you Wisconsin Milk Marketing Board for your sponsorship of the First Annual Wisconsin Grilled Cheese Championship. The Madison region is open for business! Startup Week/Weekend and our Capital Entrepreneurs. I'm looking forward to sharing a presentation on food entrepreneurship at Sector 67 as part of Capital Entrepreneurs Week and the Startup Weekend in Madison (WI) next Monday. My new friend Chris Meyer is the Founder at Sector 67 in Madison. Chris created the beautiful 'Wisconsin Grilled Cheese Championship' toast pictured here for last weekend's First Annual Wisconsin Grilled Cheese Championship. My family just met Chris and they concluded he's the perfect guy to rationalize putting metal things into plugged-in toasters to create food art. Don't try this at home. 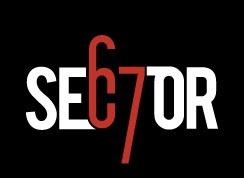 Sector 67 represents amazing possibilities for economic development in our region and beyond. "Sector67 is a non-profit collaborative space in Madison, WI dedicated to providing an environment to learn, teach, work-on, build, and create next generation technology; including software, hardware, electronics, art, sewing, pottery, glass, metalwork, iPhone/Android applications, games, etc." I'll be making a presentation on food entrepreneurship at Sector 67 next Monday, April 30, along with House of Brews Founder Page Buchanan. Join us! Visit Sector 67. Thanks Chris and friends for your sponsorship of the First Annual Wisconsin Grilled Cheese Championship and the upcoming startup events in the Madison area this week. Thrive in our region. Advance Now. On Wednesday of this week, our regional economic development group, Thrive, will meet to launch a new strategic initiative called Advance Now. Thrive represents the 8 counties of the Madison (WI) region. My presentation will focus on the Thrive Region's plans to advance innovation and entrepreneurship. I have the good fortune of presenting this innovation strategy with Kevin Conroy, CEO of Exact Sciences. The Madison region, with its world renowned university research budget, exceptional workforce, and the spectacular beauty of our natural environment make this a place you want to grow your life. Our strategic physical and digital location make this one of the best regions in the world to create and grow globally relevant new enterprises. Join us for our Madison region Advance Now strategy roll out this Wednesday, April 25. Thrive. Economic development for the Madison Wisconsin region. First Annual Wisconsin Grilled Cheese Championship a resounding (and delicious) success! What a wonderful day. What a great celebration of Wisconsin cheese and the glorious grilled cheese sandwich. This competition was created by our Iowa County Area Economic Development Board Chair, Dr. Lorin Toepper, and supported and promoted by our entire board (as in sweeping floors and setting up tables - thank you!). Our First Annual Wisconsin Grilled Cheese Championship was resoundingly supported today in Mineral Point by a wonderful community of grilled cheese lovers from near and far. I know of people that visited today's event from at least 6 states. It also felt like most everyone from Iowa County and the Madison area were there too. This was really fun. I'll report back on a full list of the competitors and winners as well as grilled cheese sandwich details soon. Congratulations to all the competitors! Many thanks to all the grilled cheese lovers who joined us today in Iowa County for the First Annual Wisconsin Grilled Cheese Championship. What a fun launch of an exciting new tradition! First Annual Wisconsin Grilled Cheese Championship. Iowa County Area Economic Development Corp. Come grow with us. Wisconsin Grilled Cheese Championship - Saturday - Iowa County Fairgrounds. Be able to tell your friends you were at Wisconsin's first annual grilled cheese competition! "April 21: Wisconsin Grilled Cheese Championship, Mineral Point. The name says it all, as amateurs and pros compete. There will be lots of grilled cheese sandwiches, tomato soup, beer and wine available for purchase, along with music. Free." "The season opener of food culminates with the inaugural Wisconsin Grilled Cheese Championship in Mineral Point. Both amateur and professional chefs will take part in this griddle-top contest, all looking for top honors in four categories: classic, classic plus one, classic plus extras, and classic dessert. Organized by the Iowa County Economic Development Corporation, the championship is a showcase of Wisconsin cheeses, and multiple exhibitors will be on hand through the event. Attendees hungry from watching the contestants will be able to purchase grilled cheese sandwiches and tomato soup. Iowa County Fairgrounds, Fair St., Mineral Point, 10 a.m.-2 p.m., free admission. See Facebook, and call 608-341-6797 for more info." "April is National Grilled Cheese Month and, as with all things cheese, Wisconsin obsesses best. Proof? The Iowa County Area Economic Development Corporation will host the first Wisconsin Grilled Cheese Championship this Saturday, April 21, (10 a.m.-2 p.m.) at the Iowa County Fairgrounds in Mineral Point. 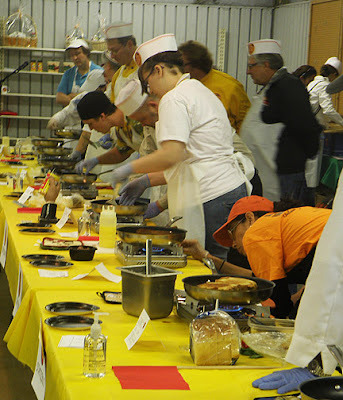 Competitors will vie, with spatulas at the ready, to prepare the most appetizing combination of bread, butter, and real Wisconsin cheese. There’s no better time to celebrate the simple charm of the grilled cheese sandwich, according to Lorin. “We see this trend repeating itself through history all the time. Whenever the economy tanks, people retreat back to the familiar comfort foods,” Lorin says. Participants will compete as an amateur or professional in one of four categories depending on the complexity of their sandwich recipes. They will be awarded points for taste, appearance, and style. Admission is free to watch the competition unwrap one slice at a time, visit the exhibits area, and listen to live music, all while experiencing a cheese overload. Of course, grilled cheese’s eternal partner in crime, tomato soup, will be available for purchase, along with beer and wine. Viewers of Channel 27′s Wake Up Wisconsin were treated to examples of delicious grilled cheese sandwiches prepared by Dr. Lorin Toepper, executive director of economic and workforce development at Madison College and chair of Iowa County Area Economic Development Corporation (ICAEDC). Anchor Dani Maxwell, who will also be one of the judges at the competition, interviewed Dr. Toepper about the Championship and then enjoyed several freshly prepared sandwiches featuring local Wisconsin ingredients. Toepper cooked a sandwich representing his take on each of the four categories: Classic, Classic Plus One, Classic Plus Extras, and Classic Dessert. For the Classic, Lorin featured Otter Creek’s Organic White Cheddar and Ramp on Oakhouse Bakery’s White Bread, along with real Wisconsin Butter! For the Classic Plus One, Toepper paired 5-year old Hook’s Cheddar with crumbled bacon from Neuske’s Applewood Smoked Meats (this was a favorite of meteorologist Brian Olson1) on the Natural Bakery’s Wheat Bread. Taking a French twist on the Classic Plus Extras, Toepper featured some President Brie on Madison Sourdough Wheat Bread with sauteed mushrooms from HiddenValley and fresh tarragon. Finally, Dr. Toepper paired Uplands Cheese’s Pleasant Ridge with Quince and Apple’s Strawberry and Rosemary Preserves for his take on the Classic Dessert sandwich. Thanks to WKOW-TV’s entire crew for supporting our event! Spatulas up! In conjunction with the Wisconsin Milk Marketing Board (WMMB), the Iowa County Area Economic Development Corporation (ICAEDC) will celebrate National Grilled Cheese Month by hosting the first annual Wisconsin Grilled Cheese Championship (WGCC) on Saturday, April 21. Amateur and professional grilled cheese makers will compete in pursuit of the perfect grilled cheese sandwich from 10 a.m. to 2 p.m. at the Iowa County Fairgrounds in Mineral Point, Wis.
Lorin will also be on Wisconsin Public Radio's Joy Cardine show this Friday 4/20 from 6 to 7 AM talking about this great event. Join us at the First Annual Wisconsin Grilled Cheese Championship! This Saturday. Iowa County fair grounds, Mineral Point, Wisconsin. 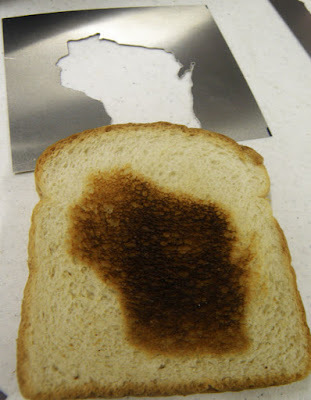 Register for free tickets to the First Annual Wisconsin Grilled Cheese Championship. Iowa County Area Economic Development Corporation (ICAEDC). Iowa County Poultry seminar was great! What a great launch for our Iowa County Poultry project. 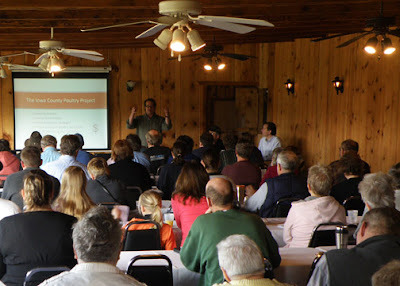 About 100 people came to our first seminar on Saturday, April 14, from every corner of our beautiful Iowa County, Wisconsin region. If you would like to buy or even pre-order beautiful pasture raised poultry from our area, please contact me. Also if you missed the seminar but would like to learn more, please get in touch. This is a great opportunity to continue to develop an effective platform for local foods-based economic development. Our economic development organization is buying and renting a mobile poultry processing unit to help develop this opportunity. 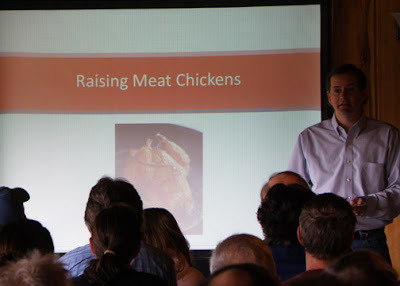 We met many friends at the seminar who are going to start or expand local poultry flocks. There were also a number of people present who are interested in using the rental poultry processing equipment to start their own businesses offering poultry processing services to local farms. The presentation was led by ICAEDC Board members Dr. Lorin Toepper, and Steve "The Slayer" Christianson, along with legendary local farmer John Adametz. 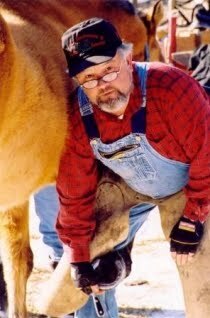 John, owner of A to Z Percherons, near Highland, WI is a two-time world logging champion and has recently been named Midwest Horseman of the Year for 2012. On hand was another great Iowa County farmer Scott Palan who helped launch the project in 2011. In John Adametz's portion of the presentation he bragged how he was promoted from being the designated "cleaner," to a "gutter," and finally an "eviscerator" without ever leaving his chair! This great event was organized in large part by my good friend Beth Rosenthal. Thanks Beth! Thanks to everyone who participated in this year's Iowa County Poultry Processing seminar! A to Z Percherons. Congratulations 2012 Horseman of the Year John Adametz! I'm committed to finding new ways to do sustainable work. We are in the renaissance age of entrepreneurship globally, and it's just beginning. I started these posts when growing our last business into one of the most honored startups in the country. Today is the seventh anniversary for this Sustainable Work blog. What a ride. My business partner Dave and I invented and manufactured some very cool ways to recycle industrial fluids in heavy industrial plants. In 2005 we were awarded the Small Business New Product of the Year, by the National Society of Professional Engineers (NSPE). NSPE certifies the highest engineering standards in the world. We had wonderful customers on 6 continents including many of the best manufacturers in the world, like Pratt & Whitney Rocketdyne (photo credit). We ran this amazing business and manufactured some of our best products right in the county where I live. We also had employees across multiple states. We exported worldwide. We sold that company in 2007. I started a software company while I developed and taught courses on starting and growing micro-enterprises. I taught these through the great Small Business Center at Waukesha County (WI) Technical College, and online nationwide. Recently I've had the wonderful opportunity to work directly in economic development across big regions. In one sense it's an entrepreneur's dream job (at least mine) - a great opportunity to create positive change in turbulent times. The Dow dropped 700 points on my first day on this job, and the great recession was officially declared that day. I remember starting our first business in the early 1970s, when the idea of entrepreneurship was treated as some kind of learning disability. When we sold that enterprise 25 years later, we'd raised our wonderful daughters in the business and helped them through college and into new lives. And we're still all great friends! Then Dave and I created our green manufacturing startup in a completely new field. A post from earlier this year sums up my current thinking about the core work of entrepreneurship: "Entrepreneurship is the pursuit of opportunity without regard to resources currently controlled." Opportunities for creating solutions to important problems are within reach of everyone. I wrote the masthead for this blog seven years ago today and haven't changed it since. You can do it. Welcome. Happy 7th Anniversary Sustainable Work! Our award for United States Small Business New Product of the Year by The National Society of Professional Engineers. Our Fast Company award as one of the 50 most innovative firms in the world, The Fast 50. Wisconsin's New Product of the Year Award. This award was presented twice for two different inventions we designed, commercialized and sold worldwide. Photo courtesy of Pratt and Whitney Rocketdyne. 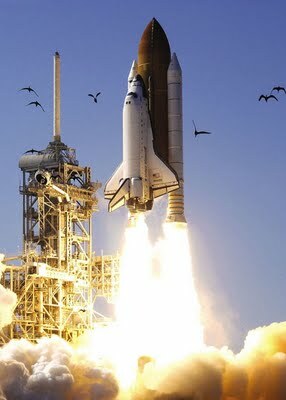 Space Shuttle Atlantis (STS-110). Pratt & Whitney chose our inventions for industrial fluid recycling when they re-tooled their two main space manufacturing plants in California creating a global best practice for green manufacturing. Thank you for your patronage Pratt & Whitney, and all our other great manufacturing friends worldwide. Thanks to all the thousands of customers, friends, co-workers, mentors, and competitors I've had the great honor to work with through 40 years of entrepreneurship. I'm especially honored by my current affiliation with the amazing Wisconsin Innovation Kitchen and of course, our Iowa County (WI) Economic Development Corp.
'The Coming Jobs War' and what entrepreneurship can do about it. 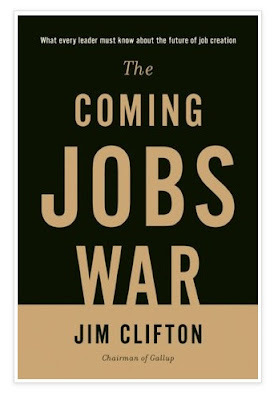 The Coming Jobs War is an important contribution to entrepreneurship, governance and job creation: "This changes everything for world leaders. Everything they do – from waging war to building societies – will need to be in the context of the need for a good job." First some excerpts about the premise of this book, then quotes for Mr. Clifton's chapter on Entrepreneurship VS Innovation and how both fit into the solution. "Six years into our global data collection effort, we may have already found the single most searing, clarifying, helpful, world-altering fact." "What the whole world wants is a good job." "This is one of the most important discoveries Gallup has ever made. At the very least, it needs to be considered in every policy, every law, every social initiative. All leaders – policy makers and lawmakers, presidents and prime ministers, parents, judges, priests, pastors, imams, teachers, managers and CEOs – need to consider it every day in everything they do." "That is as simple and as straightforward an explanation of the data as I can give. Whether you and I were walking down the street in Khartoum, Cairo, Berlin, Lima, Los Angeles, Baghdad, or Istanbul, we would discover that the single most dominant thought on most people's minds is about having a job." "Humans used to desire love, money, food, shelter, safety, peace and freedom more than anything else. The last 30 years have changed us. Now people want to have a good job. This changes everything for world leaders. Everything they do – from waging war to building societies – will need to be in the context of the need for a good job." "Creating good jobs is tough, and many leaders are doing many things wrong. They're undercutting entrepreneurs instead of cultivating them. They're running companies with depressed workforces. They're letting the next generation of job creators rot in bad schools." "What the U.S. needs more than anything in its quest to win new good jobs in its cities is that rare talent to start companies or to create business models that work, that grow organizations - big ones, small ones, medium-sized ones, sustainable ones." "Here is a Gallup economics finding that few leaders anywhere know: Even the best ideas and inventions in the world have no value until they have a customer." "Entrepreneurship is more important than innovation. The supply and the demand is backward here: Almost all countries, states, and cities have bet everything on innovation. Innovation is critical, but it plays a supporting role to almighty entrepreneurship. The investments should follow rare entrepreneurs versus worldwide oversupply of innovation. Put another way, it's far better to invest in entrepreneurial people than in great ideas." Sustainable Work first post. April 12, 2005. Dubuque, Iowa. Oh my, what fun! The First Annual Wisconsin Grilled Cheese Championship will be held April 21 in Mineral Point. You should register for a free ticket now and join the fun! Heard of flash mobs? Let's turn this into the world's first Grilled Cheese mob! Come to the First Annual Wisconsin Grilled Cheese Championship. Show your support for Wisconsin cheese makers and rural Wisconsin. Enjoy a wonderful weekend of learning, eating, and growing your regional food economy. Our Iowa County Area Economic Development Corp. (ICAEDC), is hosting this wonderful event. Sponsors of the First Annual Grilled Cheese Championships include the Wisconsin Milk Marketing Board, Regal Ware, Madison College (MATC), Wisconsin Cheese Originals, Sector 67, Channel 27 WKOW, Driftless Market, Melthouse Bistro, Wisconsin Cutlery and Kitchen Supply, Sterno, Kessnich's, Neuske's Meats, Green County WI Tourism, and our Iowa County Area Economic Development Corporation. Come for the weekend if you can. Iowa County, just west of the Madison area in beautiful Southwest Wisconsin is an amazing venue. We have great hotels and beautiful B&Bs to accommodate your visit. Hike our state parks. Learn about and enjoy the opportunities of the region. Join us for a great weekend in beautiful Iowa County, Wisconsin. We've got great prizes for our Wisconsin Grilled Cheese Champions. To enter as a Grilled Cheese Championship competitors, it's only $10 to register as an amateur and $20 to register as a professional. Imagine the great bragging rights you'll earn by winning. Don't miss this cool promotional opportunity for yourself or for your food establishment. Our ICAEDC Board Chair Dr. Lorin Toepper and my friend Beth Rosenthal have done all the heavy lifting for this great event. Well done Lorin and Beth! Join us for the First Annual Grilled Cheese Championship in Mineral Point, WI, April 21, from 10 AM to 2 PM. See you there! Register for your FREE ticket to the First Annual Wisconsin Grilled Cheese Championships. Great lodging options in Iowa County. Show your support. 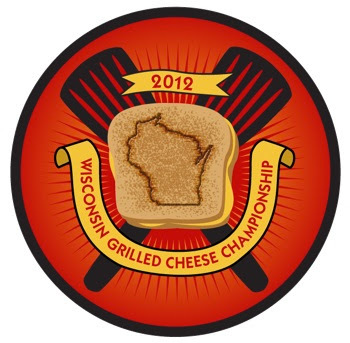 Buy great gear with the great Wisconsin Grilled Cheese Championship logo. You'll always be able to say yours is from the First Annual! Iowa County Area Economic Development.